Note: BHON now evaluates using the widely accepted DBSP System (Drunken Bar Slob Percentile). For a more detailled explanation of our scoring system, please see: Our Reviews Explained. Parking: Paid Parking Only - Fuckers!!! Intersection: Victoria & Walnut St. The second new review of 2008 brought us to the Wild Mushroom Sports bar and Grill. 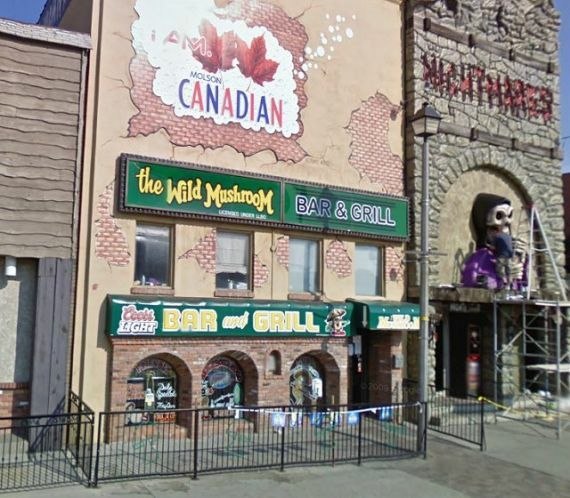 Located on Victoria Ave in Niagara Falls, right in the heart of the tourist district, we weren’t sure what to expect. Since they beat us to the number one spot on Yahoo search, we figured we should check them out and see what all the hoopla was about. Wings: - Very good, above average size and a rather unique sauce. A step above the average Franks Hot Sauce wing, with a significant afterburn. We also tried the suicide sauce on the side, as well as a couple pounds of the Cajun style, which were also suitably spicy for our tastebuds. Some good pizza to be had as well! Beer: - Guinness on tap at just under six bucks for a 20oz glass was a pretty good deal. No complaints here, so we drank 22 of of them. Atmosphere: - Cozy kinda 70’s rec room ambiance to the place. We liked it. What’s with all the american dollar bills slapped all over the place though? Guess if we run short on money for the tip we’ll be set! Overall a decent bar. We had to knock them a bit for the paid parking, but that applies to any bar in the Falls tourist district. The prices were quite good considering their location and definately worth a revisit in the future.